Well at Christmas time I decided to make my fella something nice for our soon to be new house. I went to Bird textiles and bought some of their Sydney-designed, hand printed fabric. Bought remnants to sew together patchwork style to make a cushion cover, using nice olive and natural colours that I thought would go with the couch and also the views from the loungeroom which features big gum trees. - Well, making something with patchwork strips is heaps slower than just using normal slabs of fabric. Hmm, note to self. - Fabric is remarkable forgiving about non straight seams - everything seemed (no pun intended) to line up ok in the end despite doing it all by eye and not having everything perfectly symmetrical on the grain etc. - Buttons are yet to be attached, oops. 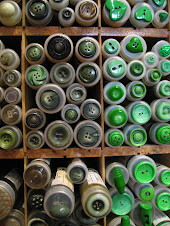 Got a bit frightened off the whole button hole cutting step. Must do that this weekend. Thanks to Miss Snapdragon for her help and technical advice. 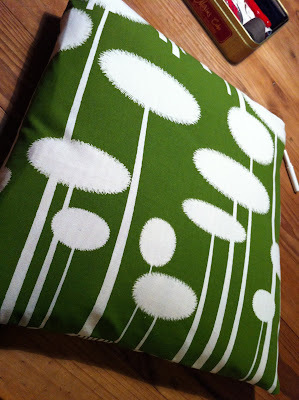 Cushions are such a satisfying thing to sew - quick and instantly usable!! You did a lovely job and fabric is fantastic!